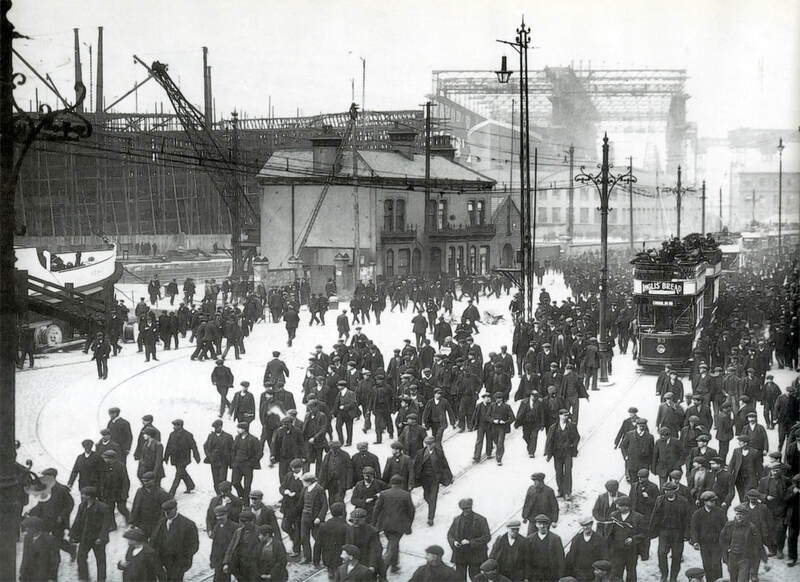 Below: Men knocking off work at Harland & Works shipbuilding docks in Belfast, Northern Ireland. 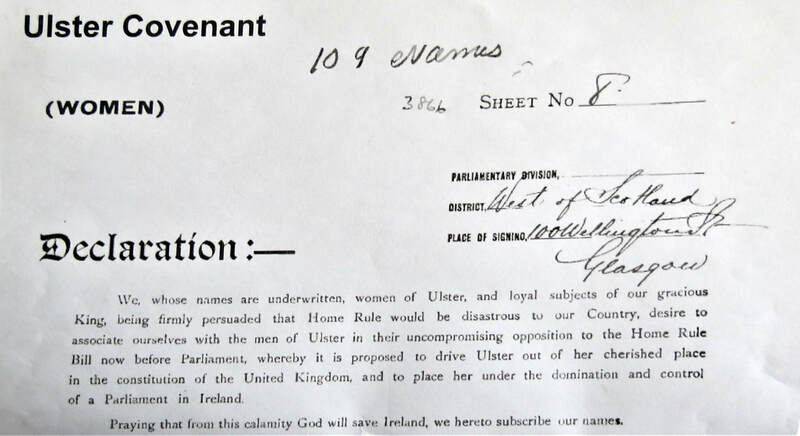 Below is an Ulster Covenant form with the date 1912 on it. ​My curiosity is like that of a Scottish Wildcat. I am sure that is why I have always wondered about how my Irish Grandmother, Olivia Horner met and married my Scottish Granddad, Robert Rennie, one of the many questions that I thought would never get answered. Imagine my surprise and delight when I found the answer to not only that puzzle, but many more answers than I could have imagined. Just amazing. Come with me on my journey and see how it all came about. For those of you that have Irish ancestors, this journey may just benefit you in finding your ancestors. I can assure you, it has not been easy, but the reward is so worth the work. Due to lack of information in Ireland, the information site is free. Fair warning, not all records will be found. My questions opened up a Pandora's box that gave me more answers to my Grandparents and my Great Grandparents, more than I ever imagined. How wonderful is that! Birth records at the Civil records of Irish Genealogy helped me find Olivia. Olivia's father's name was Andrew, a carpenter by trade. ​Olivia's mother name was Jane Montgomery. Andrew and Jane were my Great Grandparents. That was news to me. As I kept digging, I found that most Church records were online. This is a good source if you know the Church or the County they were born in or married at. I found my Grandmother Olivia's records of her birth and her marriage to Granddad Robert. They were both 22 years of age when they married. They married in Belfast. The address on the documents for the marriage certificate showed they were neighbours living on the same street in Belfast, both living with their parents. Grandad Robert's father's name was listed as Matthew as an Engineer. Now I have found my Great Granddad's name. Curious how they were all living as neighbours in Belfast, and what were they all doing? Now their address was within walking distance of Harland & Wolff; they are shipbuilders. They were one of the busiest shipbuilders in Belfast during this time. The famous ship Titanic was getting built here. I am positive this was where my Granddad Robert and his father Matthew and Grandma Olivia father Andrew were working as it was within walking distance of the shipyards. Thinking that was the reason Robert and his parents had moved to Belfast to work at the shipyard? My wildcat curiosity kicked in compelling me to look up the name Horner and Montgomery. Another surprise seems that both families were considered Ulster Scots. What does that mean? They came from Scotland in the 1600's and settled in Ulster, Northern Ireland. ​The story is that Viscount Montgomery who was born in Ayrshire, Scotland, was the one that started the Plantation of Ulster. James V1 of Scotland 1st of England had lands confiscated from the Gaelic nobility of Ireland, and they had fled Ulster to Europe, this was after the defeat of the Battle of Kinsale in 1601, and the end of the Nine Year's War in Ulster in 1603. They were forced into exile by the victorious English Government of Ireland. Viscount Montgomery was friendly with the King and was granted land in Ireland, with conditions that no Catholics were allowed to be employed, or to lease land only English speaking Protestants were allowed. This was a problem as well, as a lot of the Scottish that migrated only spoke Gaelic, this part of only speaking English was ignored for the Scottish. In later years more Scottish people migrated to Ulster in large numbers. The name Montgomery had many famous people in the family tree. One was General Monty Montgomery of WW2. Doing more research on the Montgomery family name to find out how and if related. Now that I have established the Horner's and Montgomery were Ulster Scots. Let me explain more. There was in 1638 a movement called the Scottish Covenants. They were being persecuted in Scotland for their Presbyterian beliefs so they migrated to Ireland to get away from it. This was now under Charles 1 rule, as King James V1 had died. This movement played an important part in the history of Scotland. These people also fled to Ireland. The conflict arose between Church and State in Scotland those remained steadfast in their beliefs refused to take an oath to the King saying he was not the head of the Church. They were punished and many were forced to pay the ultimate price for this by laying down their lives. I mentioned this as the Scottish Covenants had a bill made up was the blueprint for the Ulster Covenant Document. I dwelled into the Ulster Covenant. I looked at the site PRONI, which stands for Public Record Office of Northern Ireland. 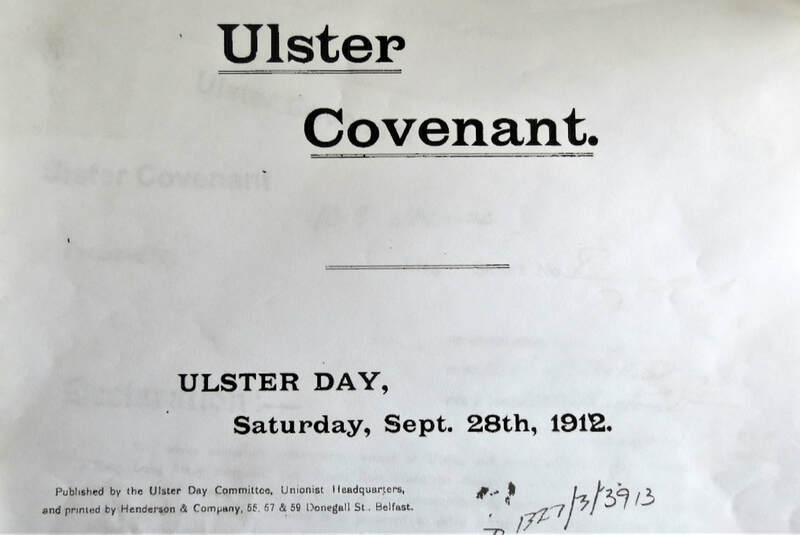 On September 28th, 1912 the Ulster Covenants was signed by Ulster-Scots for Home Rule, giving Ireland a limited measure of local autonomy. Unionists, labourers, professionals, aristocracy and clergy signed. They were 237,368 men and 234,046 women who signed this. My Grandma's parents and their parents signed this document. That was further proof for sure they were from Scotland and moved to Ireland in the 1600's. So my Irish Grandparents and ancestors now turned out to be Ulster-Scots. Wow! Out of curiosity, and I still do not know why I did it, I typed in Rennie. Well, Great Grandad Matthew and Great Grandmother Mary signed this as well. Matthew wrote down that he was born in Ballyclare, County Antrim, Mary McGavin was born in Dungannon, County Tyrone. Below is another Ulster Covenant form specifically for women. Now, this was the biggest surprise, my Scottish Great Grandparents Rennie was not Scottish but Irish, My Granddad Robert was born in Denny, Stirlingshire, Scotland. ​My Dad always said the name Rennie came from Denny, it appears the only Rennie that came from Denny was my Granddad Robert. Now I have Irish Great Grandparents who were originally from Scotland, they are called Ulster-Scots. My Scottish Great Grandparents who I believed to be Scottish are from Ireland. Mind boggling I am thinking. How come my Dad never told me? Likely he did not know. Now more things are clearer. Grandad Matthew and Andrew both born in Ballyclare they likely knew each other, that would account for them living in the same street as neighbours and working at the shipyard. Grandad Robert and Grandma Olivia eventually moved back to Yoker, Glasgow was a district beside the River Clyde. I know from that area that Grandad would be working in the shipbuilding yards. There were two that were near him – one in Whiteinch, and it was called Yarrows Shipbuilders, and the other one was John Brown Shipyard; they were in Clydebank. My Granddad Robert sailed to the United States by himself in the 1920's, as it seems economics of the country precipitated a downswing in the shipbuilding industry. My Granddad left behind my Grandmother and four children. He sailed for a better life, must have been for himself as he never brought his family out to America. I often think how hard it would have been for my Grandmother to raise four children by herself, those would have been hard times, a single Mother you would have to call her, no support. ​The only thing my Dad regretted was that he was not able to continue on with his education, he had to go out and work, and during those hard times, my Grandmother had to pay the company for my Dad to get an apprenticeship, and the oldest brother which was my Uncle John; he got to further his education. No one ever complained. They all pulled together and made it work, even though it would have been hard times for the family.